The Ranger is a warrior who has not only learned the lore of the woods but stands as the protector of good and civilization in the wilderness. She is an able combatant, skilled tracker, wielder of druidic magik, and the fiercest of enemies to certain groups of creatures. She swears herself to the cause of good (Rangers must be of good alignment.) and that she will live by the highest code of honor with regards to her duties, looking always to defend the lives of innocents. Like Knights, Rangers are either a member of an Order or in service to a Liege Lord. As such they can be found acting as a local sheriff, game warden, army scout, or spy. All Rangers must obey the Law and the Ranger’s Code. If a Ranger violates this code by her actions then she must stand before her superiors to be judged. The primary attribute for this class is Constitution with Wisdom and Dexterity as secondary. 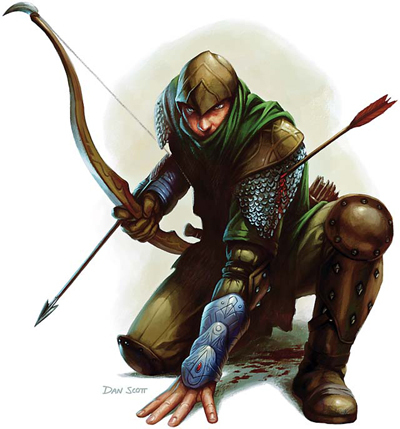 Dex: 12 Wilderness Prowess: The Ranger is adept at making his way without being detected easily. He is able to Hide in Shadows (Rural), and Move Silently as per the Ranger Skill Table below. Due to his expertise and wariness, the Ranger is only surprised on a 1 in 8. 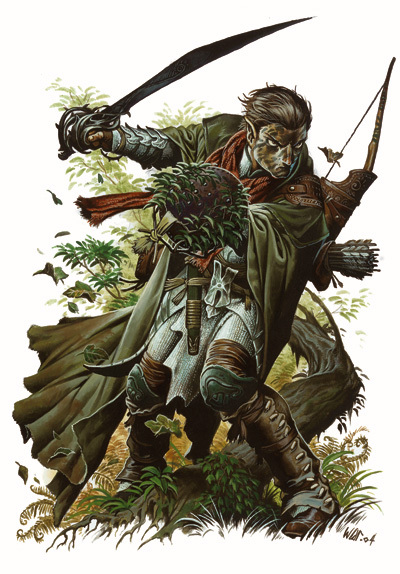 Dex: 13 Druidic Learning: In the wilds, the Ranger has come under the tutelage of the Druids or Priests of a nature faith, and has gained a limited ability to use their talismans. The Ranger calls the Talisman at the first level of skill and advances from this point. This is listed on the Ranger Skill Table below. Con: 14 Master of Terrain. In any zone where the Ranger has the Survival Skill, she can get along in the wild while moving at full speed. The character can provide food and water for one other person for every 2 levels. She automatically succeeds on all skill checks against severe weather. The character can extend this benefit to one other character for every 2 levels. The Ranger is able to ignore overland movement penalties of terrain. The character and her mount can move at full overland speed regardless of terrain. The character can extend this benefit to one other character for every Title gained. Finally the Ranger can identify race/kind of creature(s) by tracks. Baneful Enmity: When attacking her arch-nemesis, any successful attacks that can be critical are critical (i.e. unadjusted attack rolls of 37 or more are considered a critical hit. ), and the Ranger gains a +10 bonus when tracking her arch-nemesis and may track them even if the enemy crosses a body of water or phases temporarily. — The Ranger has much skill in the traversing of the wild and is an adept tracker; see Tracking Section under Ranger Skills below. The Ranger improves this skill by +1 for every two levels. Furthermore, Rangers are adept with both trained and untrained creatures aided by a limited degree of animal empathy. See Ranger Skills below. –The Ranger is the foremost protector of civilization and good in the wild. As such he gains a bonus in combat against a particular class of creatures who represent an arch-nemesis to his cause. He gains a +2 to hit against this group as well as +2 per every two levels to damage. The Ranger will attack the group with whom he has enmity before other foes if possible. The Ranger must declare his enmity prior to advancing to 3rd level. Choices include but are not limited to: Troll class, Goblin class, Giants class, Undead class, Orks, Vorgeel, even particular classes such as Necromancers or Evil Priests etc. The Ranger has gained field training and been hardened for a life lived in the wild and as such gains several skills. The Hide in Shadows skill of the Ranger is for Rural Environments only. 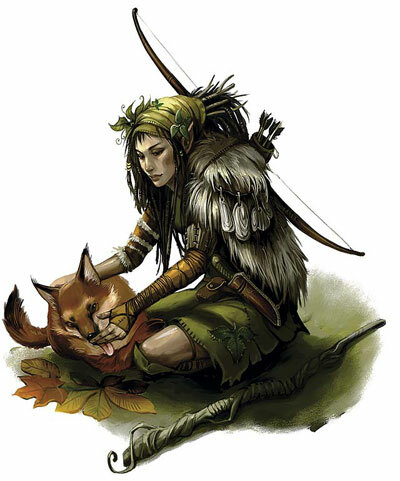 Druidic or Nature Deity Talismans are not chosen from a list as Priests; rather Rangers are taught specific Talismans and as she learns them the Ranger may make use of those specific Talismans only. The number of Talismans learned is equal to the level of the Ranger. Thus at 5th level the Ranger is given five Talismans and this increases by one per level. Rangers have learned to master a limited degree of animal empathy. If a ranger carefully approaches or tends any natural animal, he can try to modify the animal’s reactions. (A natural animal is one that can be found in the real world — a bear, snake, zebra, etc.) When dealing with domestic or non-hostile animals, a ranger can approach the animal and befriend it automatically. He can easily discern the qualities of the creature (spotting the best horse in the corral or seeing that the runt of the litter actually has great promise). When dealing with a wild animal or an animal trained to attack, the animal must roll a saving throw vs. charm to resist the ranger’s overtures. (This table is used even though the ranger’s power is non-magical.) The roll is modified by a -1 penalty on the die roll for every three experience levels of the Ranger (-1 at 1st to 3rd, -2 at 4th to 6th, etc.). If the creature fails the saving throw, its reaction can be shifted one category as the ranger chooses. Of course, the ranger must be at the front of the party or alone and must approach the creature fearlessly. Rangers are exceptional trackers and use the following guidelines when attempting to track quarry. Note that unlike the standard tracking skill Rangers do not suffer the -4 penalty to their rolls. The modifiers found on the tracking table below are cumulative –total the modifiers for all conditions that apply and combine that with the tracker’s Wisdom score to get the modified chance to track. For tracking to succeed, the creature tracked must leave some type of trail. Thus, it is virtually impossible to track flying or non-corporeal creatures. The DM may allow this in rare instances, but he should also assign substantial penalties to the attempt. To track a creature, the character must first find the trail. Indoors, the tracker must have seen the creature in the last 30 minutes and must begin tracking from the place last seen. Outdoors, the tracker must either have seen the creature, have eyewitness reports of its recent movement (“Yup, we saw them Orks just high-tail it up that trail there not but yesterday.”), or must have obvious evidence that the creature is in the area (such as a well-used game trail). If these conditions are met, a proficiency check is rolled. Success means a trail has been found. Failure means no trail has been found. Another attempt cannot be made until the above conditions are met again under different circumstances. – The chance to track decreases (terrain, rain, creatures leaving the group, darkness, etc.). – A second track crosses the first. – The party resumes tracking after a halt (to rest, eat, fight, etc.). If the tracker fails a proficiency check, another check can be rolled after spending at least one hour searching the area for new signs. If this check is failed, no further attempts can be made. If several trackers are following a trail, a +1 bonus is added to the ability score of the most adept tracker. Once he loses the trail, it is lost to all. If the modifiers lower the chance to track below 0 (for example, the modifiers are -11 and the character’s Wisdom is 10), the trail is totally lost to that character and further tracking is impossible (even if the chance later improves). Other characters may be able to continue tracking, but that character cannot. A tracking character can also attempt to identify the type of creatures being followed and the approximate number by rolling a proficiency check. All the normal tracking modifiers apply. One identifying check can be rolled each time a check is rolled to follow the trail. A successful check identifies the creatures (provided the character has some knowledge of that type of creature) and gives a rough estimate of their numbers. Just how accurate this estimate is depends on the DM. When following a trail, the character (and those with him) must slow down, the speed depending on the character’s modified chance to track as listed on the Tracking Table. The character must have a minimum of a 12 Constitution, 12 Wisdom, and 12 Dexterity. Rangers either swear to follow a Liege Lord or are part of an Order of Rangers. When they enter service they are sworn to obey their superiors or lord but they are further enjoined to obey the Ranger’s Code. If a Ranger violates this code or the law by her actions then she may be called before a council or her lord to be judged. If she is found guilty the Ranger will be subject to appropriate punishment by these authorities. The code is laid out below. -Protect the innocent and your charges. – Never abandon an ally, friend or noble cause. -Defend your territory with your life. -Adhere to the Law and see it obeyed. -Administer your office and duties with mercy and wisdom. -Avoid deception, cheating, and stealing. -Present yourself as a standard before all men. -Never betray your post, your order, or your conscience. -Restrict material wealth to only that which you can carry. -Beware of threats and know your enemy. -Meditate and be mindful of your surroundings. -Be prepared at all times. Rangers are trained by their order or by other Rangers of friendly disposition.